The Exhibition continues until Saturday 27th September 2014. Sometimes you see a painting somewhere, are rooted to the spot and go wow. 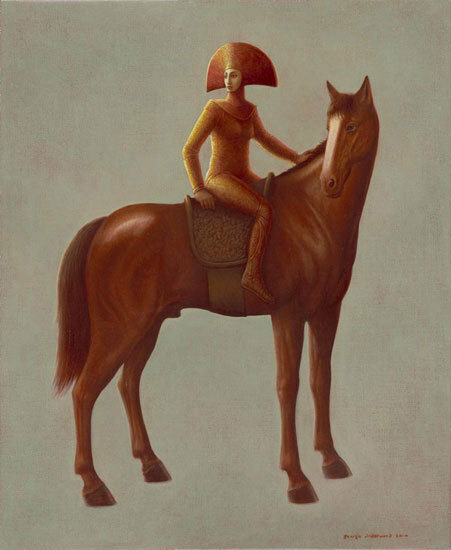 I can be belligerently hard to impress, but impressed I was when I had my wow moment in front of George Underwood’s painting ‘I Believe in You’ at the 2008 RA Summer Exhibition. An elegantly simple portrait of a woman with only her face showing, embellished by a headdress that continued down her body; the face was motionless, and her soft eyes looked directly towards, even through me. She did not feel of our time, and above all was beautiful in her singularity. 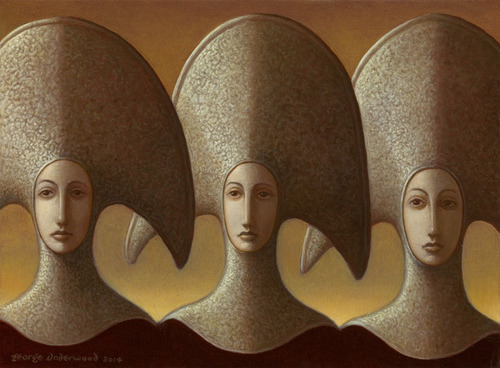 George Underwood was born in 1947 and studied at Beckenham and Ravensbourne College of Art. A would-be musician, at college he formed a band with old school friend David Robert Jones. They made a record, indeed George also made a solo record before realising that this was not his forte. Mr Jones, naturally, wanted to be an artist. It is uncanny how these images inhabit their own world so completely. George breathes an icy life force into them. They do not move, they are at permanent attention as though on parade, as though subjecting themselves to our scrutiny. I have always loved George’s work. I think he may well have unconsciously tipped me towards music. Sitting alongside him in art class convincing me amongst others that I would never achieve his fluidity of line, his sense of “ rightness” in relation to his subjects. I got my dad to advance me the money to buy an alto sax instead. Over the years George has risen above even his extraordinary beginnings and in my opinion is producing some of the best work of his long and fecund career.